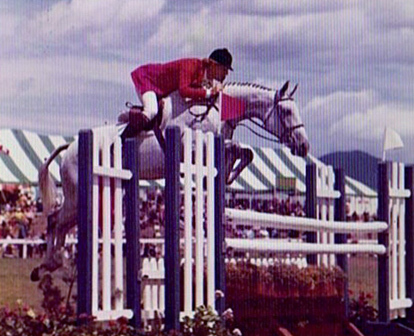 1960 roan stallion; Good Twist was an international star, winning 21 classes in the United States and Europe, including the Prix du Champion at Ostend in 1969, the Frederick D. Mackay Memorial Trophy at the National Horse Show in 1972 and 1973 and was part of the 1972 winning Nations' Cup teams. 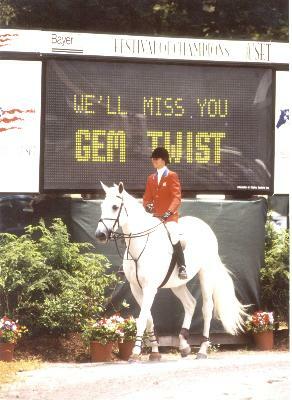 In addition to his accomplishments in the show jumping arena, Good Twist is famous for siring the famous American show jumper, Gem Twist (Icey Twist). Gem Twist (Icey Twist) 1979 grey gelding; Gem Twist was a world champion show jumper and is the only horse to win three American Grand Prix Association Horse of the Year titles. 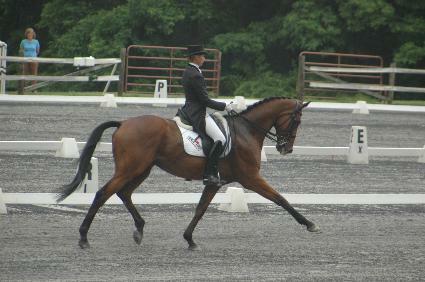 He competed in Grand Prix competitions for nine years, earning two silver medals at the 1988 Olympics and World's Best Horse at the 1990 World Equestrian Games. He was inducted into the Show Jumping Hall of Fame in 2002. 1968 gray horse is by Irish Lancer out of Shoenail San Felipe was bred, born and lightly raced in Puerto Rico before being purchased by Jane Matos in 1972 as a jumping prospect. 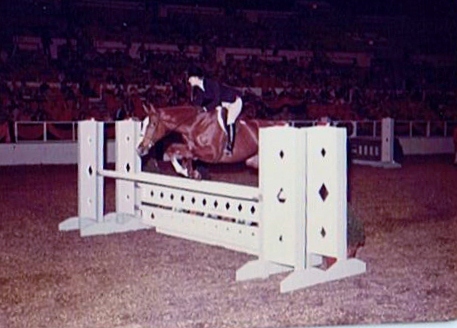 In the fall of 1972, Morton Turbow and his daughter, Pam Rush, ne'e Turbow, saw the horse being schooled and immediately concluded it was an excellent prospect for a top junior hunter or jumper. The horse was transported by air in the fall and put into training with Christina Schlusemeyer and rider Rodney Bross. San Felipe was pregreen champion a few shows in the fall before going to the 1973 Florida Winter Circuit as a First Year Green Hunter. San Felipe was the only horse to be Green Hunter Champion during the circuit not ridden by superstar, Rodney Jenkins. By circuitend, San Felipe joined Hill Top Farm and the team of Chief and Rodney Jenkins. San Felipe went on to win numerous championships at the most prestigious shows in the country including Devon, Lake Placid, Washington International, Harrisburg, and the Royal Winter Fair. Rodney Jenkins won more Grand Hunter Classics (comparable to today's International Derby) on San Felipe than on any other mount from 19731976. He was AHSA (now USEF) Regular Working Hunter of the Year in 1975. 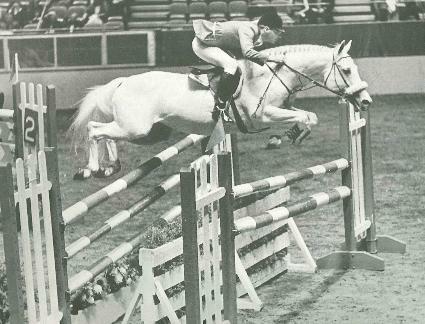 In 1978 he was sold to a junior client of Bobbie Reeber near Montreal as a Junior Jumper. For several years in Canada he was a top Junior Jumper before being retired. In 1986, he was returned to Pam Rush in Jacksonville, FL where he remained retired on the family farm until his death in 1989. Sea Lord; 2001 bay gelding: Sea Lord competed to the Preliminary level of eventing with Phillip Dutton and Boyd Martin before moving to competitive dressage, where he is successfully competing at the Grand Prix level. Accomplishments include the Champion at the GAIG Region 2 Finals in Intermediate II and Reserve Champion at the Prix St George Regionals. Touch of Class was foaled on April 27, 1973, and was first registered as Stillaspill with the Jockey Club, having a brief racing career before being trained as a showjumper. In 1981, in her first year at the Grand Prix level, she won classes at several shows, and in 1982 she qualified with Fargis for the USET''s team for the World Championships in Dublin. When an injury took Fargis out of the saddle in 1982, Touch of Class was turned over to Conrad Homfeld, and the team won the Grand Prix at Southampton and came in 4th in the 1983 World Cup. With Fagis back in the saddle, Touch of Class was part of Nation''s Cup teams that won in Rome and Calgary in 1983, and in later in her career she was also on Nation''s Cup teams that won in Aachen, Washington and New York. In 1984, Touch of Class and Fargis won the Grand Prix of Tampa. 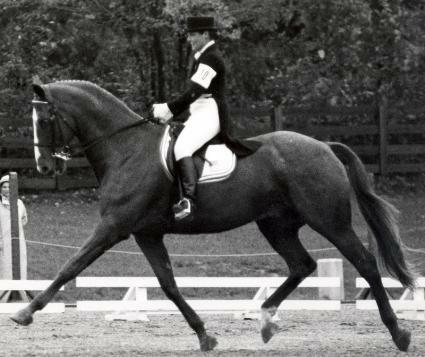 Touch of Class was part of the 1984 Olympic Team posting the first double clear rounds in Olympic history, taking home two gold medals, and leading her to be named the first nonhuman Olympic Female Equestrian Athlete of the Year. 1965 chestnut mare by The Hammer out of War Garb War Dress was bred and born in Virginia by Mrs. A.C. Randolph. It was the result of the second paring of The Hammer and War Garb. A 1962 offspring of this pair (Gargoyle) had shown outstanding athleticism but had been put down after a serious leg injury. War Dress began her showing career in 1971 as a junior hunter ridden by Charlie Weaver. Without heavy campaigning, the pair finished in the top ten in the country. In 1972 and 1973 Nancy Baroody got the ride and twice finished Horse of the Year. In 1974 with her last junior rider, Pam Rush, ne''e Turbow, she finished in the top ten again and in 1975 she concluded her showing career with the pair being named Junior Hunter Horse of the Year. War Dress returned to Mrs. Randolph''s Virginia farm where unfortunately attempts to produce another generation were unsuccessful. She passed away peacefully on Mrs. Randolph''s farm in late 1978. Keen (Willoughby) 1966 chestnut gelding; Bred on a racehorse farm in Riverside, California, Keen was repurposed as a dressage horse after proving too tall, at 17.2 hh, for a successful career on the racetrack. 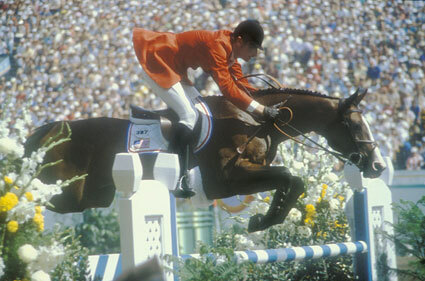 Named USDF Horse of the Year an incredible 5 times, Keen won Gold and Silver medals at 2 Pan Am Games, helped lead the U.S. to a bronze medal at the 1976 Summer Olympics and competed again in the 1984 Summer Olympics at the age of 18.